Google Analytics comes with a lots of great stock reports, but oftentimes you need to create custom reports to answer more questions. I usually create custom reports for clients like Verizon, Chivas Regal, and Sonic Drive-in to determine customer paths, conversions, and best traffic sources. I highly recommend getting Google Analytics certified if you can. I am, and it has helped tremendously in my job as both a Web Developer and Web Analyst. Are my users getting the same site experience? Are mobile users bouncing more than desktop / laptop users? Are mobile users spending more time on the site? I explain this report below. This report conveniently shows your pages that have some social interaction – a Facebook Like, Tweet, Google+ circle, Google+ +1, etc. It starts by listing the pages and then you can drill-down to see the details. You won’t get social plugin data without proper analytics code like the one generated by my Professional Share WordPress Plugin. In this search report I focus on keywords. Keywords give you great insight into the flow of traffic into your site. When you write content, you have an idea of the keywords YOU THINK people are searching for. This report shows how people actually arrive at your site. I explain this report below. 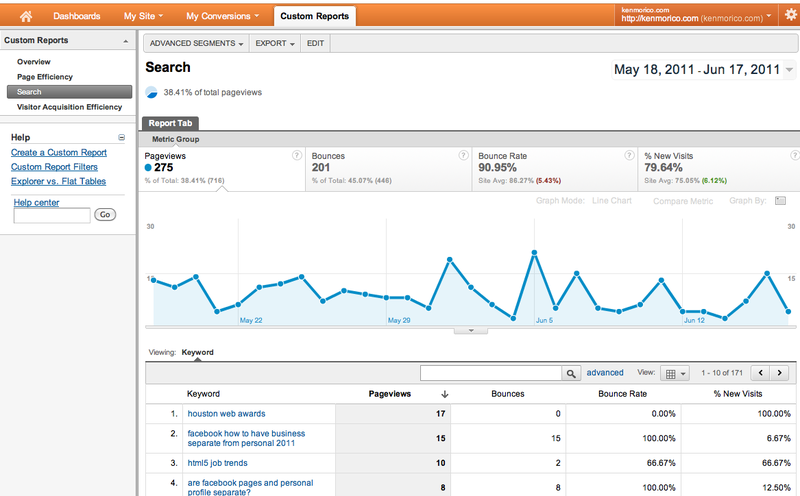 This report I converted for use in the new version of Google Analytics. I created this report based on Avinash Kaushik’s post 3 Awesome, Downloadable, Custom Web Analytics Reports. This is one of my favorite reports right now. It focuses on traffic quality by source. Visit Avinash’s blog for report details. This report I converted for use in the new version of Google Analytics. I created this report based on Avinash Kaushik’s post 3 Awesome, Downloadable, Custom Web Analytics Reports. This report breaks down your pages and helps you spot problems. Visit Avinash’s blog for report details. Nearly all companies and individuals with an online presence need to focus on search. The reasons are many – a large portion of traffic can come from search, high rankings establish site quality and trust, and Google’s new +1 button can give you a credibility jolt. 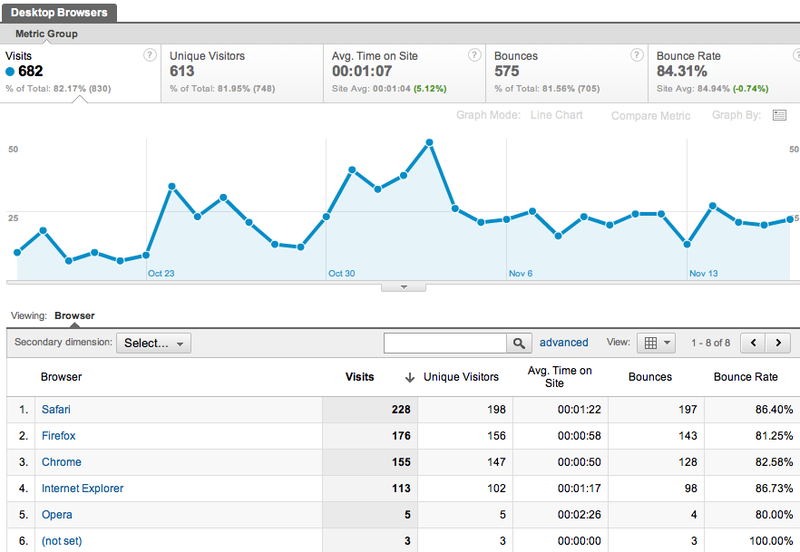 If you haven’t check out the new beta version of Google Analytics v5 be sure to play around with it. In this search report I focus on keywords. Keywords give you great insight into the flow of traffic into your site. When you write content, you have an idea of the keywords YOU THINK people are searching for. This report shows how people actually arrive at your site. I am always surprised with the keywords I find in my report. Oftentimes I change my content based on good ideas I receive from searchers. This report starts with a view of keywords – keywords from all search engines. I don’t care what search engine they come from (at least at this point). The bounces and bounce rate fields tell me if the searchers found what they were looking for and were interested enough in other content in the site to continue reading. Most times, people find the content they want on your site and leave. That’s common. The art of making a great site means marketing content, products, or services to users, or in this case searchers. The more you tweak your content and market your other content, products, or services, the lower the bounce rates and higher the traffic. Clicking through on the hyperlinked keywords will take you to the landing pages for the keywords. Did users reach only one page? Or do multiple pages rank for certain keywords? A trend in search right now is that users are typing in long-tail keywords – full phrases other than generic keywords. As phrases gain in popularity with the autocomplete algorithm, your site can match for the full phrase. That’s gold. There’s a problem with myopia on the Web. Site owners make the assumption that everyone sees their Web site the same way they do. There are thousands of device and browser combinations. How do you solve for the differences in configurations that contribute to higher bounce rates and dissatisfied users? Google Analytics gives you the tools to see what’s going on, but oftentimes data needs to be arranged to come to conclusions and actions to take. Now more than ever with desktop AND mobile browsers, you need a way to sift through user experiences because usually they won’t tell you they had a bad experience – they just go somewhere else. Using this report you can see how users experience your site with different browsers. With many rushed sites these days there often isn’t time to optimize experiences for all browsers. 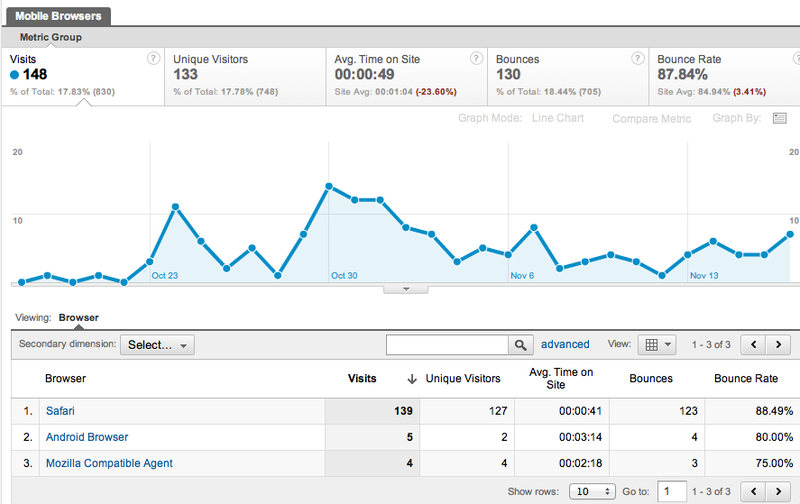 With this report, you can clearly see which browsers have higher than usual bounce rates and time on site. Using a newer HTML5 WordPress theme and custom HTML5 code on my site, I am able to get a fairly normal variance in my bounce rates. Since most of my content is blog related and most of traffic organic search traffic, my bounce rates are a little high, but content ranks well in Google search engine results pages because my click-through rate (CTR) is good. Internet Explorer, in general, isn’t standards-compliant, so some design elements might break or look clunky resulting in a higher bounce rate. When I segment site visitors by mobile browser, things look a little weirder. Bounce rates peak and trough a bit. Mobile browsers are very different from regular browsers in that the screen is a lot smaller. My site and blog are optimized for mobile, so my bounce rates aren’t in the 90s. But even so, some users seem to be having a better experience. I’d need to do more testing to find out what’s going on. The weird thing about Google Analytics is that it groups tablets as mobile devices. To me, tablets function more like desktops because their screen resolution often meets or exceeds them. Using a standard HTML5 site, a Web site should look the same on a tablet as it does on a desktop. Mobile browsers are almost always fully HTML5 compliant. Using either the desktop or mobile report I created you can drill down to see specific browser versions. For example, there is a huge difference between Internet Explorer 6 and Internet Explorer 8. If everything checks out on the browser side, it’s time to look at other areas of optimization like search [see keyword search report explanation above]. Remember that Web sites should be responsive, that is to say they adjust from large 27″ iMacs to mobile browsers. The kenmorico.com site is a good example of this. I find that since implementing the responsive design on my site my analytics numbers smooth out and everyone seems to have a good experience. Bounce rate, time on site, and other metrics seem to equalize. Custom reports can save you a lot of time digging through all the data in separate standard reports in Google Analytics. Sometimes you can’t even create a custom report using the standard Web interface. In that case, you’ll need to write some software using the Google Analytics API. (Not a do-it-yourself job.) To really save time without digging through any reports, check out Google Analytics Intelligence Events. It’s like having a full-time data scientist on staff! Custom reports should answer questions. In the end you should either be learning about your users and their behaviors to improve content, or analyzing conversions and paths. In particular I like the stock Funnel Visualization report. Funnels and goals are a great complement to custom reports because they are so useful. Every business should try to have multiple streams of income, and funnel visualizations can help to easily see where users are coming from and where your site needs conversion improvement. If you have your own reports worth sharing let me know and I can add them to the list. I hope you find these reports useful. Let me know of any problems accessing / using the reports. I got 6 LinkedIn shares at my page but when I look at analytics – Traffic Sources – Social – Plugins it shows zero… How come? And now when LinkedIn Signal is retired is there a way to see the actual shares on LinkedIn, what they shared, who shared, comments etc? One more free feature you can also avail is Analytics report via SMS. Even if you don’t have any data plan you can receive Google Analytics report in your phone.